Stand at the top of your mat, feet inner hip distance apart, hands in prayer at your heart. Pressing your palms together, draw your shoulders back and down, lifting your heart. Close your eyes, bow your chin, and recall your intention for the year ahead. Deepen the breath. Not sure what your intention is? Simply hold space for an intention to arise. Be still and breathe, expanding your entire torso with every inhale, and softening on every exhale. Take five deep breaths. From Mountain Pose, exhale, lower your hands to your sides, and open your eyes. Inhale and reach the arms up and overhead, palms facing one another. With your right hand, grab hold of your left wrist. Inhale and lengthen your spine, pulling the shoulders down away from the ears; exhale and make a side bend to the right. Repeat on the second side. Don’t be surprised if the sides of your body feel shockingly tight after a day or two of lounging around—they just need to be opened back up. Lean forward and back here, accessing the stiff places along your sides and outer shoulder blades. Breathe deeply into the lungs, rib cage, and entire side-body as you open and lengthen. Build more pranic energy by linking movement and breath with Half Sun Salutations. From Mountain Pose, inhale and reach your arms overhead; exhale into Forward Fold, extending long over your legs, bending the knees as necessary. Next, inhale, and with your fingers on the mat or pressing off your shins, extend the spine forward, back flat. Exhale and fold back in. Inhale, and pressing down through the legs, extend your heart forward and up, rising with a flat back, reaching your arms out and up. Exhale and bring your hands together at your heart. Repeat. Do as many Half Sun Salutations as feels good. Slow down the breath and movement to really marry the two. If you’re comfortable, close your eyes and anchor your awareness to the unique rhythm of your breath. 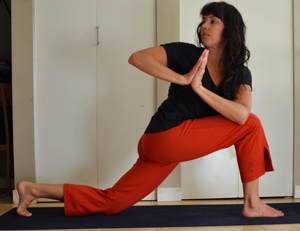 From Forward Fold at the top of your mat, step your left foot back and lower the left knee. Inhale and reach your arms overhead. Hook your thumbs, palms facing forward; draw your waistline, shoulders, and arms back. Inhale and grow tall from your pelvis; exhale and lean up and over to the right, pulling the shoulders down away from your ears and deepening the front knee. Your back foot pointed, feel a deep stretch along the inner left leg through the left belly. Lean forward and back here, finding areas needing extra attention. Inhale, then exhale and bring your left hand to your right knee, reaching your right arm to the back in a Twist. Deepen your Twist by hooking your left elbow outside your right thigh, hands in prayer at your heart. Take five breaths, then repeat on other side. Rest in Child’s Pose, your big toes together, knees outer chest distance apart, bottom to heels, arms reaching forward. As you breathe, settle into the hips, feeling the sides of your body and reconnecting to your intention. Stay here as long as it feels good. From Child’s Pose, inhale onto all fours with your shoulders over your wrists and knees under hips. Inhale and drop the belly, lift the heart and tailbone, and look up; exhale and press the mat with your hands and knees, pull the low belly to the spine, round the spine to the ceiling, and look toward your belly. Feel free to make hip circles, rib cage rolls, and move your spine in any way here. Our spine houses our nervous system, affecting the health of our organs, glands, and emotional state, so keep your spine supple and elongated. Overhead stretches and side bends every morning keeps your spine healthy, makes you feel better, and helps you stay alert and productive all day long. From all fours, come into modified Plank, your knees down. Inhale and shift your chest forward over your fingernails; exhale and lower your chest and chin, with your bottom in the air for Eight-Limbed Pose. Then, inhale and slide the belly forward and reach the legs back, pointing the feet. Lift up through the heart, pulling the shoulders back and down for Baby Cobra. Exhale and extend your belly and spine forward and back down to the earth; inhale and press back up to your hands and knees. Exhale and press back into Extended Child’s Pose. Inhale into all fours, then exhale back into Eight-Limbed Pose, repeating the above series. Once you’ve done five or so rounds, rest in Extended Child’s Pose before sitting up. Once you’re back up, move through your body, do some “Good morning” stretches, some light twists, maybe a few hip circles. Notice the difference ten minutes of moving, opening, and lengthening has just made. Now you’re ready to go out and rock the new year!